Dollar strength was curbed today after a disappointing jobs report showed that US private sector employers added few jobs than expected in July. The data led traders to heed caution ahead of Friday’s broader nonfarm payrolls report. According to data processing firm ADP, 185,000 new jobs were created in the private sector last month. A further knock came as the company also revised June’s figure down to 229,000 from 237,000. The ADP report is usually delivered two days before the nonfarm payrolls, so it is seen as something of a forward predictor. The correlation is not exact by any means but it’s sufficient enough that markets will be positioning more cautiously towards Friday’s release. The nonfarm payroll report is closely watched by the Federal Reserve and feeds into its policy decisions. The expectation is that 220,000 jobs were added across the US economy last month. 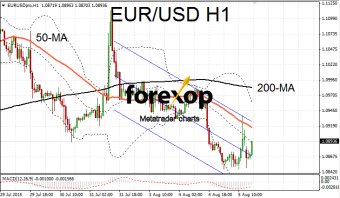 The euro traded positively on the back of the disappointing jobs data as did other majors. EUR/USD lifted close to 0.5% reaching 1.0892 but was struggling to remain above the 1.09 barrier. 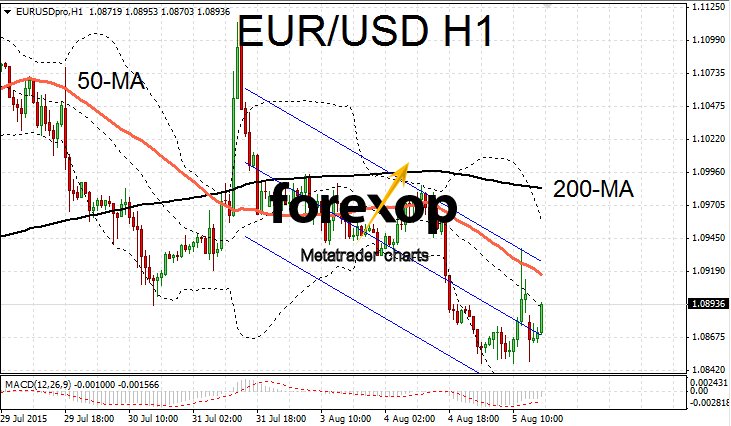 Despite some upward momentum on the short frames, EUR/USD remains in a downwards channel on the hour chart. Bearishly the pair has failed to remain above the 50-point moving average for the past week. Resistance is around 1.1083 and support at around 1.0822. Some respectable data from Germany helped to prop up the euro. According to Markit Economics’ latest survey the German service sector expanded again in July. A news release that showed the purchasing managers’ index edged up to 53.8 was welcomed and gave the single currency a minor boost. Also adding to positive sentiment was a report showing that French service industry remained stable on the month. The composite PMI reading for the Eurozone was 54 – just beating the consensus forecast of 53.8. The fortunes for the Eurozone remain mixed however as a later report showed retail sales dipped in June. Eurostat reported that retail sales across the Eurozone for the year grew at 1.2% to June. This was well below the expected figure of 1.9% but was not a huge surprise given that there were signs consumer spending had softened during the first half of the year. USD/JPY rallied to 124.8 but started to come off the boil late in the session as dollar buying lost momentum. USD/JPY found support at the day’s pivot level around 124.7 where it was consolidating a 0.5% rise. Yen traders are reacting cautiously in the run up to scheduled statement from the Bank of Japan on Friday as well as a raft of economic data.